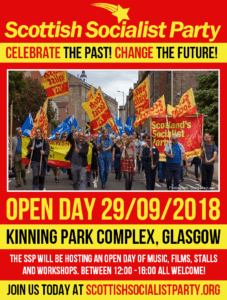 Glasgow South SSP held a hugely successful open day on Saturday the 29th September in the Kinning Park Complex. The loose theme was “Celebrate the past, change the future” and the day consisted of stalls, music, film and workshops all accompanied by much conversation and tea. 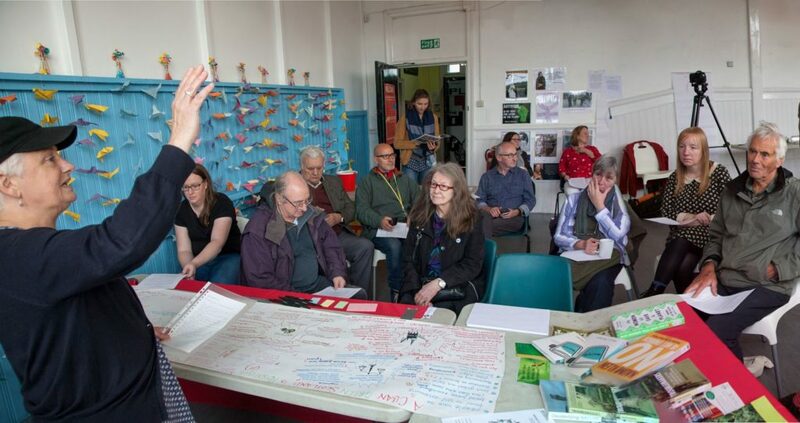 Our initial aim for the event was to create an open and inclusive environment for dialogue, debate and discussion amongst party members, potential members and activists across the Southside, in an informal and non-structured setting. Additionally, we also hoped to reconnect with branch members who haven’t been able to be involved in recent branch activities and, hopefully, to recruit new members to the party. Despite a few hiccups with the promotional strategy, we achieved a good turnout on the day; the hall was buzzing all afternoon, numerous £10 an hour petition signatures were collected, and Voice sales were good. The workshops were excellent; the level of engagement and interest generated was apparent from the many contributions made by those present and the content of discussion was thought provoking, well informed and highly relevant to the current political climate. The event also proved worthwhile in terms of party recruitment. On the day, three new members were signed up, and thanks to the wonders of the party’s updated joining process, had been formally allocated to the branch and all paying their subs by the end of the day. It’s hoped that the success of the Open Day will encourage members, who for a variety of reasons can’t make branch meetings or other activities to get involved, time will tell, but without doubt, two of our three initial aims were met, and even surpassed. 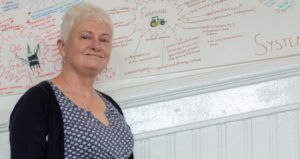 The SSP, as a party is known for its detailed socialist programme based on a solid class analysis, but the party has good green credentials and excellent environmental policies too. These have been discussed at our regular branch meeting political discussions which lead to the inclusion of the workshop “For a clean, green Scotland”, which was the result of extensive research, preparation and effort by a branch member. It was exceptionally well received on Saturday. Green issues and economics are closely related, and it is clear the root cause of many environmental issues is, simply, the capitalist system. The links between the SSP’s raft of policies, including the ongoing campaign on £10/hr wages linked to a minimum 16 hours contract, and a sustainable, fair society are obvious. 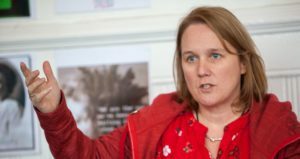 EC member Dawn Fyfe provided an anti-capitalist structural analysis of socialism and women – which was informal but clear. The SSP is well placed to combine all of these questions and provide a coherent direction to future activities and campaigns. The Open Day was the most ambitious event the branch has held recently, and it is rewarding that the work and effort put in by many branch members has proved to be worthwhile. Undoubtedly it will give our branch a boost, the recruitment of new members and the success of the event itself will raise moral and keep the branch enthusiasm levels high. The hard graft to organise the event has proved more than worthwhile, and Saturday’s success demonstrates the steady progress made in building the branch over the last year or so. It points the way forward for Glasgow South. It’s hoped that this year’s inaugural Open Day will be the first of many, and our thanks go to all those who made the effort to attend and support the event.